The first edition of the On Our Own Together Too transitional housing program came to a successful conclusion on December 15. OOOT-TOO features two months of supported independent living in a full-featured two-bedroom apartment. SMILE participants Brodie and Heather (celebrating, right) served as the pioneers for OOOT-TOO, and they were clear upon the conclusion of the program that they were not in any hurry to return to their family homes - not because they do not miss their parents and siblings, but rather because they enjoyed the challenges and rewards of greater personal responsibility. OOOT-TOO is supported by a three-year grant from the Community Foundation of Ottawa, and will serve a total of 18 individuals by 2010. This was the second Family Fun Night of 2007-2008 and also the second time in the new location at the Good Companions Centre. The reviews are in, and the feedback can be summarized as follows: this was perhaps the best Family Fun Night of all time! There was something in the air from the very start. The mingling activity was embraced enthusiastically by parents, participants, and siblings as they sou ght out personal details from others to fill in their bingo card. The holiday quiz games were also received with a nice mix of competitive spirit and togetherness. And it was all capped off perfectly with special guest Maureen Moloughney whose marvelous guitar and voice sent everyone home wanting more. But the somewhat unexpected highlight of the night was a collaborative performance of The Twelve Days of Christmas. Many laughed so hard they were in tears. The finale is too difficult to describe, so the curious are invited to view the final round of this performance on video. Over 425 tickets have already been sold for the LiveWorkPlay New Years Eve In Ottawa party in the ballroom of the Crowne Plaza, easily surpassing the old record of 260 in the old penthouse location. With a pending sellout of 500 seats, 8 new tables have been added making 80 extra seats available. Tickets can be purchased online only (no telephone sales) until they sell out from newyearseveinottawa.com. Special thanks to out to A-Channel and The BEAR 106.9 FM for their on-air promotions in support of the event? Don't delay, buy today! The Quickie store on Stonehaven Drive in Kanata is now selling break-open lottery tickets in support of LiveWorkPlay with expected net revenues of $10,000 or more per year. The BMO Fountaion of Hope Employees' Foundation has contributed $5000 to LiveWorkPlay in support of the On Our Own Together affordable housing initiative (permanent housing). Kanata branch manager Peter Strittmatter dropped by in person to present the cheque (pictured right). The Ottawa Senators Foundation (Go Sens Go!) has granted $5000 in support of the Journeys program for youth intellectual disabilities. 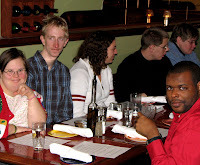 After a very busy fall season SMILE participants and staff gathered in the banquet room of Biagio's Ristorante to celebrate their accomplishments. Everyone remarked on the increasingly meaningful nature of the achievements being celebrated. "I moved out on my own" and "I am enjoying my volunteer work at the Ottawa Food Bank" and "I am taking the bus instead of getting a drive with my parents" are examples of what some participants chose to share. 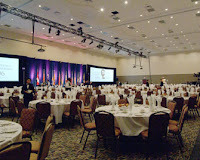 The mini-banquet (so-named in deference to the public "big banquet" known as Engines of Success that takes place in June) also offers the opportunity to practice public speaking and also public listening. When is the last time you saw a group of more than 30 people sit silently listening to a speaker finish what they were saying despite a hot meal sitting in front of them? Well, it happened. SMILE participants have a lot of respect for each other, and this is just one small way that they showed it at the December 2007 mini-banquet! Facebook...it's the social networking website that has taken the world by storm, and Journeys and SMILE participants are riding the wave! Along with the fun and opportunities made possible by Facebook and related websites, also comes a number of safety issues and concerns. At last month's LWP Annual Family Conference many parents were asking for help with Facebook issues, and in response LiveWorkPlay staff hosted an evening workshop. 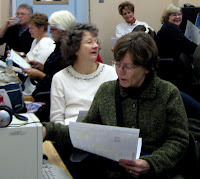 Originally scheduled for 90 minutes, the evening stretched to more than 150 minutes as the workshop attendees created their own accounts, became familiar with safety and security issues, learned how to use privacy settings, and practiced communicating with their inbox, wall, and applications. If you are a Facebook user, be sure to search on LiveWorkPlay and join our Facebook group! You will find photo albums, videos, links to all of our events, and more! 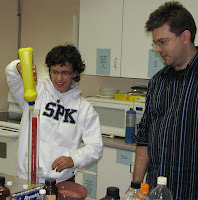 Professor Jeff Manthorpe from Carleton University spent the night with Journeys participants and got the group fired up with a variety of scientific experiments! Jeff specializes in the study of synthetic organic chemistry. This is important for everything from pharmaceuticals to herbicides, but it also means he is really good at burning things in a fun but safe way! The group also experimented with various elements of the periodic table and had some fun with dry ice! Professor Manthorpe was a big hit and Journeys participants will be happy to see him back in the future. Not to be outdone by Journeys, SMILE participants are working with their own academic connection, Professor Ann-Louise Davidson, also from Carleton University. Ann-Louise has been working with the SMILE problem-solving group to identify challenges people with intellectual disabilities face in their daily lives. The g oal is to come up with tools that can help participants increase their independence through the use of technology. This could include for example the use of personal digital devices to store video information to support everything from using bus routes to cooking a favourite recipe. 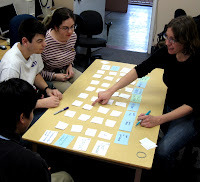 "The underlying assumption for my work with LiveWorkPlay is that through the use of participatory action research and information/community technology we can find helpful tools to promote self-advocacy," says Professor Davidson. The search for a new home for the annual Recipe for Success Culinary Adventure & Charity Auction has come to a successful conclusion. There is a new venue and a new date for 2008. The event is moving to the ballroom of the Hampton Inn Ottawa. The convenient location (next to the baseball stadium) is just off the 417 and features plenty of free parking. The ballroom will mean plenty of seating for everyone, and perhaps most importantly, Executive Chef Derek Ragnitz will help LiveWorkPlay continue the tradition of delicious and interesting cuisine that has always been a hallmark of the event. After reading this blog you may find yourself wondering how it is possible that so much has happened since the last edition of just one month ago. It takes a combination of dedicated volunteers, staff, board members, families, and community partners to make it happen. And it also takes money, of which there is simply never enough. LiveWorkPlay has a very short list of personal donors, but you can help change that! Making a donation has never been easier - it can be done as a single contribution, or better still via a monthly deduction. Just $8.33 per month results in a donation of $100 a year! 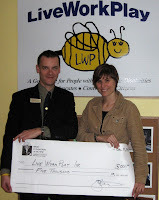 You can also donate to LiveWorkPlay in the name of another person as a tribute or as a gift. Please visit our donation page to set up your contribution today! We hope you have enjoyed this 14th edition of LiveWorkPlayNews 2007. If you have received an email about this blog in error and/or you would prefer not to receive future LiveWorkPlayNews messages, simply click here and follow the simple instructions. That same web page can also be used by newcomers who would like to join LiveWorkPlayNews, so feel free to share the address with friends, colleagues, and family who might like to subscribe.